24 VIP Casino no Deposit Bonus Codes 2019 - Get up to $1000 NOW ! Launched as recently as 2017, 24 VIP Casino has a strong focus on drawing its members from the United States. On first glance, the site offers an impressive presentation of casino games powered by Rival and Betsoft. Once you begin to peruse the finer details of playing on this site, a few issues do arise, including really long withdrawal times as well as minimum and maximum restrictions on your payouts. 24 VIP Casino offers the convenience of three ways to play – on-the-go, instant-play, and downloadable versions of the site. For players who prefer not to download software onto their devices, the instant-play mode is suitable and it does load nicely into a compatible web browser. 24 VIP Casino - Rival, Betsoft Software - Bonus: Deposit $50 and get $50 from the casino to play with a total of $100! Deposit Bonus: 100% Match Bonus Plus 240 FREE SPINS! 24 Vip Casino play now ! Some players may think the site looks dated because it offers a traditional presentation from its background to its lettering to its standard collection of graphics. Not that it matters but 24 VIP Casino has a sister site with the name Superior Casino. It does have a legitimate license, but it is from Curacao, which is known for being a bit lax in its regulation of online gambling establishments. Security and Fairness Measures: While SSL encryption is in place, at least on the downloadable version of the casino, it isn't top-of-the-line. The encryption does work for the most part, but it simply isn't the best type. This scenario is sure to change as the site matures. The 100% Match-Up Welcome Bonus is worth a look if you are just joining 24 VIP Casino. Players gain access to a 100% match on their initial deposit as long as they can complete the wagering requirement. At the end of the bonus, you also get 240 free spins good on one of the widest ranges of games for this type of deal. If you make it to a second deposit, you can use the Second-Deposit 200% Match-Up Bonus, which lets you receive a 200% match on your second deposit. Guess what? The wagering requirement is double that of the 100% matching bonus, leaving you to wager thirty times before you can withdraw any of your winnings. It does offer the flexibility of being good on Keno, Bingo, Slots, and Specialty games. For players who enjoy moving up in the ranks of gamblers the VIP Loyalty Program delivers this opportunity with four individual levels, including Silver, Gold, Platinum, and Diamond. The more you play and wager, the faster you can travel up the rungs of this prestigious ladder. 24 VIP Casino has an impressive listing of games that include the following categories: 3D Slots, i-Slots, Video Slots, 3-Reel, Video Poker, and Table Games. The site even offers a special place to see which games have recently been added to their catalog. The collection of Rival games includes Baccarat, Casino War, Keno, Roulette, Let It Ride, Red Dog, Pai Gow Poker, Craps, Scratch Cards, and Sudoku. Betsoft delivers a similar set of titles with Baccarat, Casino War, Caribbean Stud Poker, Roulette, Let It Ride, Red Dog, Pai Gow Poker, Craps, Pontoon, Three Card Poker, Spanish 21, Oasis Poker, Draw HI-Lo, 21 Burn Blackjack, Poker 3, and Predictor. Individuals from numerous countries cannot become members of 24 VIP Casino. These countries include: Netherland Antilles, Syria, Cayman Islands,Turkmenistan, Azerbaijan, Singapore, Denmark, Romania, Kyrgyzstan, Poland, Hungary, Kazakhstan, Bangladesh, Bhutan, Estonia, Costa Rica, Afghanistan, and Bulgaria. If you somehow manage to sign up, all of your winnings are forfeited. Members can easily get the assistance they need through a 24-hour help system set up to offer fast responses. Someone is always on the other end of a phone call or live chat system, ready to help with fast, user-friendly solutions. Unfortunately, if you develop a gambling problem and think you need help, don't expect to find it here. This site does not have a responsible gambling page, which means you should not join if you think you might have a problem. 24 VIP Casino has a somewhat limited set of options for deposits and withdrawals. 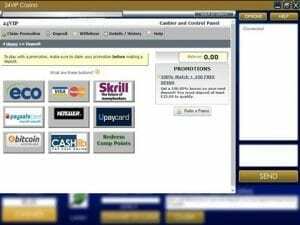 You can use MasterCard, Visa, Paysafecard, Neteller, uPayCard, ecoPayz, and bitcoin. The site accepts small deposits, so you can start out slow until you get the hang of things. Withdrawals are another matter though with strict daily and weekly limits in place. Members can only claim $500 a day and $2000 a week, which is less than advantageous for high rollers. Withdrawal times are generally slow as well, particularly if you opt for anything other than bitcoin.